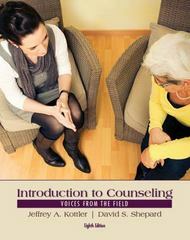 Introduction to Counseling 8 Edition INTRODUCTION TO COUNSELING, Eighth Edition provides a comprehensive overview of the counseling profession while encouraging readers to examine the day-to-day realities of being a counselor as well as their motivation for choosing the profession. Coverage includes information on what counseling is as well as its history, theoretical orientations, applications, and professional issues. As readers become engaged in the process of learning and applying counseling concepts, they get an unparalleled look at what their professional futures may hold.